Fortunately I had a few projects lined up to share with you. 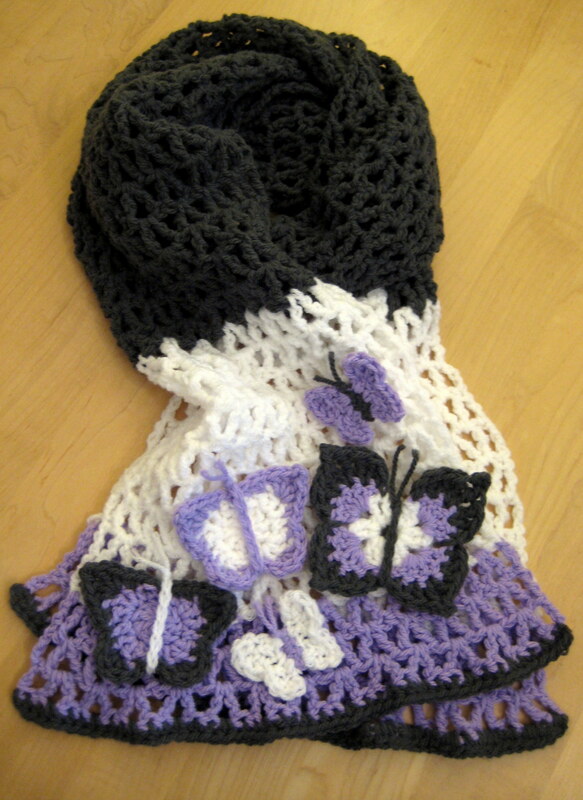 This cute butterfly scarf, for example. It is meant to have a matching hat, but since that is only half finished it will have to wait until I’m all healed up! 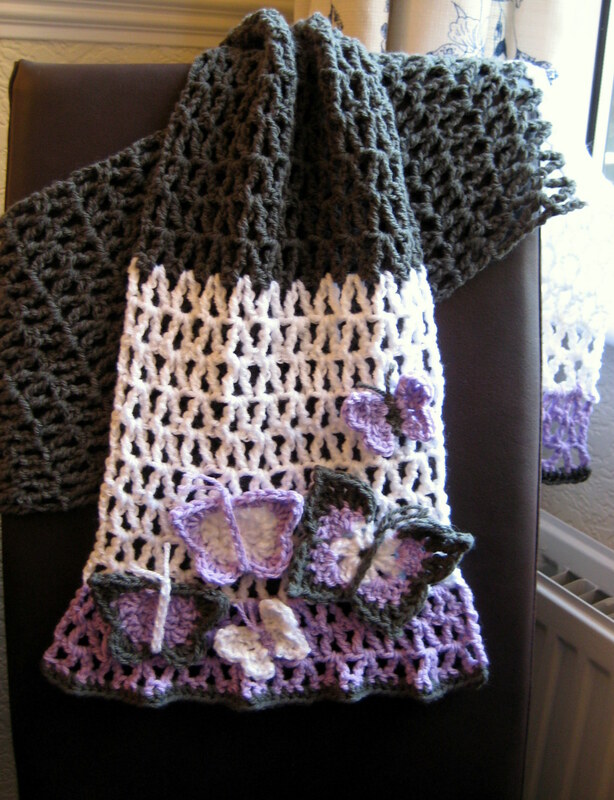 This scarf was designed especially for a family friend, who was the flower girl at our wedding. She loves butterflies and will soon be turning 9 years old. I think any age can wear this though! 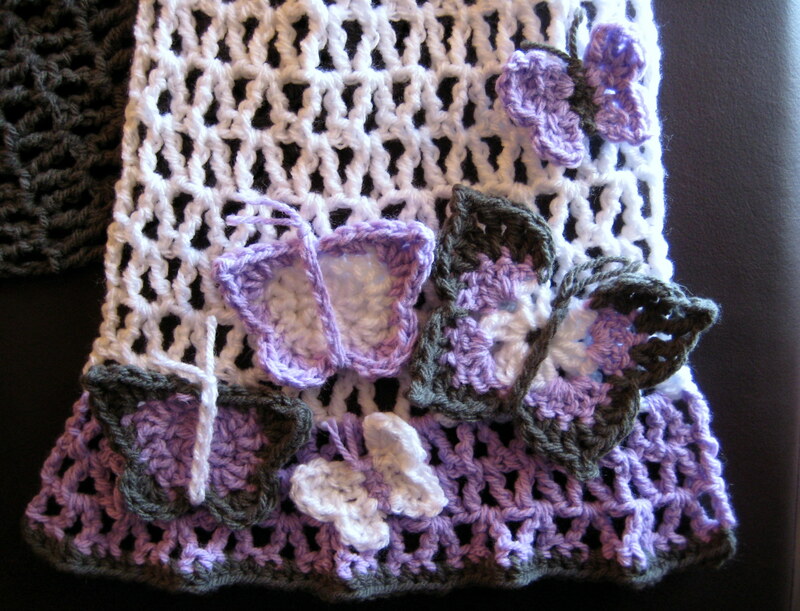 The scarf works up very quickly, and then the butterflies are made separately and sewn on. You can add as many as you like! Or why not try adding these flowers instead? You will also need a 6mm crochet hook and a yarn needle. This pattern is written using US notation. For my pattern notes, click here. tr= treble crochet- yarn over hook twice, then draw up a loop, *yarn over, draw through two loops, repeat twice from*. Begin with the white yarn. Either ch or fsc 34. Ch4 and turn. Repeat row 2 nine times, or until you are happy with the length of the block of white. Change colour to grey prior to the last ch4, repeat row 2 until scarf is your preferred length (less trim and the remaining block of white). This was 45 rows for mine! R3: (tr, ch1, tr) in next ch-sp. Now work an increase by doing a (tr, ch1, tr) in between the last tr of the space just worked and the next. [*(tr, ch1, tr) in next ch-sp, repeat from *3 more times. Work a second increase by doing a (tr, ch1, tr) in between the last tr of the space just worked and the next.] Repeat everything between for the third increase, (tr, ch1, tr) in last ch-sp, tr into very last st, ch4, turn (41 sts). R6: hdc in top of tr, *2hdc in ch sp, hdc (in top of tr), hdc (in top of tr) repeat from * to end. R7: Work an increase by doing a (tr, ch1, tr) in between the posts of the 2nd to tr’s in. *(tr, ch1, tr) in next ch-sp, repeat from *. Work a second increase by doing a (tr, ch1, tr) in between the last tr of the space just worked and the next . *(tr, ch1, tr) in next ch-sp, repeat from *4 more times. Work a third increase by doing a (tr, ch1, tr) in between the last tr of the space just worked and the next. *(tr, ch1, tr) in next ch-sp, repeat from *. Work a forth increase by doing a (tr, ch1, tr) in between the last tr of the space just worked and the next, tr into very last st, ch4, turn (41 sts). Make and sew on butterflies and/or flowers. I have put my butterfly patterns separately here, as they are also good for appliques. I recommend steam blocking this item. Pinch the flutes into shape before steam blocking if you can. Blocking this piece gives it a nice drape! What colour combinations will you choose? This is beautiful! Thanks so much for the pattern! !